There are few people who are bigger Walt Disney fans than I am. I love their films but I also enjoy stepping outside the box and discovering smaller, more quirky animated movies. A lot of times these small budget animated films can take risks a big studio with a massive budget cant. 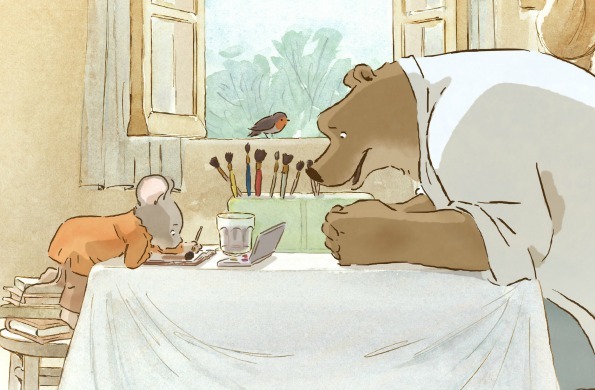 One delightful example is 2013’s Academy Award nominated Ernest and Celestine. On the surface Ernest and Celestine is a sweet little bedtime story for children. The sketchy animations style with a watercolor palate reminds me of a Winnie the Pooh or Little Prince illustration. But if you pay attention to the narrative there are subversive, surprising moments. Ernest and Celestine is based off of a book by Belgian author and illustrator Gabrielle Vincent. It tells the story of a mouse named Celestine who is taught to believe that all bears are horrible and to be feared. However, they must interact with the bears to get their teeth because in their world all mice are obsessed with dentistry (I know weird but it works). The mice kind of like the fearful tooth fairies of the bears. Unfortunately the bears also hate the mice and are horrified by their very appearance. However, a bear named Ernest is a free thinker. He’s gruff and grumbly and doesn’t want to do what his family expects for him to do (they want him to become a lawyer which I find funny for some reason). Ernest loves to sing and perform and one day he meets Celestine. He is just about to eat her when they make a deal with each other. Celestine convinces Ernest to spare her and she will show him a candy store he can eat to his heart content. In return he shows her a teeth bank that she can get her quota of teeth from. Unfortunately, the two are caught in their theft and then are on the run from the police, both mice and bear officers. Then the rest of the narrative becomes a kind of Bonnie and Clyde story for kids. This is definitely not what you expect when you see the sketchy sweet animation style. That’s what makes it so subversive. Also, the characters aren’t as sweet as you expect them to be. As I said Ernest is gruff and he stays gruff and rough around the edges through the entire movie. I appreciate that Celestine didn’t change him into something totally new. I also like how their friendship is not automatic. For a good chunk of the movie they have a marriage of convenience and not friendship. But as they spend time together cooped up in a house for the winter they start to see things from each other’s point of view. This is a good lesson for children that an immediate friendship never would have shown and something I don’t think big studio films would have the patience for. That’s what makes Ernest and Celestine special. Kids need to know that friendships take time and that we need to accept people for who they are. Someone may be a little rough around the edges but find where you relate to that person, find something to bond over. In the final act Ernest and Celestine face the legal systems of their species. They try to explain their situation to the court but the prejudices are too strong on both sides. It isn’t until an act of heroism shows the mice and bears that they realize they really aren’t that different as they thought. In today’s polarizing racial climate it is important to talk about themes of prejudice and bias with our kids. Zootopia did a great job this year with those themes but Ernest and Celestine is another fable that can also be a good teaching opportunity for families. It’s perhaps a little softer than Zootopia but equally didactic. Both are great and important tools in helping kids understand these important issues. So give Ernest and Celestine a chance. The English dub is very well done with Forest Whitaker, Mackenzie Foy, Lauren Becall, Paul Giamatti and more. Your family will love it and it will be easy to work into a family home evening. Let me know what you think if you get to see it.